Bill Lake, a native of Houma, La. grew up fishing the fresh and saltwater marshes of Terrebonne Parish. 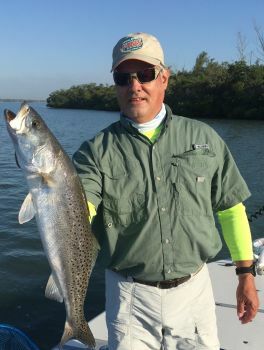 After 30 years of successful fishing, he has learned to narrow his focus to trophy speckled trout and redfish. Most of his effort & expertise is expended in the inland/coastal waters of Bayou Dularge. The Sister Lake-Lake Mechant area out of Bayou Dularge offer great springtime, fall and winter fishing for specks and reds. During the summer months of May-August, one can find Capt. Bill combing the adjacent Louisiana barrier islands and the numerous rigs/platforms scattered throughout the ship-shoal area in search of mule speckled trout! Bull redfish can be caught on a regular basis all summer long near the tidal passes of Last Island. One can also expect to catch BlackDrum, Flounder, White trout, Sheepshead and many other variety's of fish that inhabit the Louisiana coastline. See for yourself why our fertile estuaries are among the best in South Louisiana! Capt. Ricky's crew with some of those DULARGE REDFISH! All the redfish you want right now 'Down in Dularge'! Wilbert, Sammy and Gil believe in the BAYOU CHUBS fish catching ability! Another good box of Dularge Bronze-backs! A nice Dularge pond trout---5lbs. 2 oz.--------She had a 6 in. mullet in her throat and still greedy enough to attack the LSU Bayou Chub. It was her last meal.